Today we had our first lesson about Time for my grade 4 students. It was a simple lesson to introduce them to saying the phrase "What's the time?" and adding 'O'clock' as well as learning the English words twenty, thirty, forty and fifty which often come up in time. For a quick warm up I went to this site called Anglomaniacy where you can listen to the time and see it on clocks. It's a great website with lots of free downloads and lesson ideas - no register. Then we went over the key vocabulary for the lesson. You can find an option to see the textbook vocabulary for each lesson in English and Korean on most textbook CDs. We have a routine, at the start of each unit/topic to write in the new vocab for the first lesson. They write it in both English and Korean. I like this as it creates their own personal dictionary that they can refer to throughout the year and study from. For our next lesson I am going to write these three questions on the board and they have to write the answers on a paper I will give them, like a quick quiz. I will tell them that they can look in their English notebook. How do you spell 아침 식사 in English? How do you write 5.50 in English? 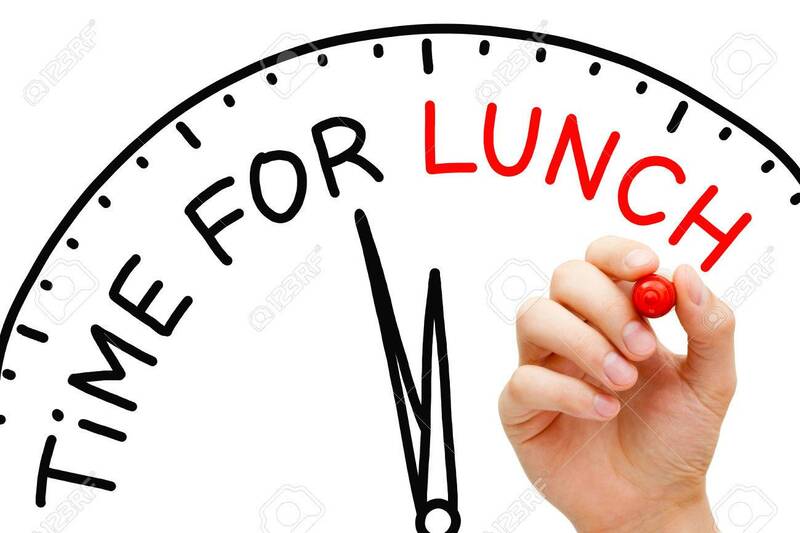 Finish the sentence: We eat lunch at _________ __________. After that, we listened to this great song that reads the book "What's the time Mr.Wolf?" I love the book as we have a copy at my other school. The Wolf is a puppet. So if you have the real book you could read it to your class and play with the puppet as you go... it keeps them interested. Now the video is great. You can skip to about 3.00 on the video and it will be a chant song that reads the book and then children are repeating - the students can repeat along with the song. It practices all the key phrases for learning time and goes over breakfast, lunch and dinner. A great song. And best of all, it's on Youtube! After, watching I asked them what time was dinner? What time was lunch? and so on.When they weren't sure we went back to check in the video. It was a good chance to do a comprehension check. I also asked them what time they ate breakfast, lunch and dinner. This was also a good chance to get them speaking. Next, we did a cool time crossword and time match up sheet. This was good to check their understanding of time. 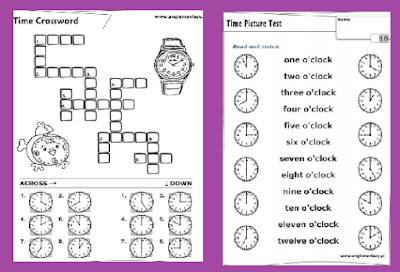 Then we reviewed as a class - I would ask "What's the time? " and they would answer according to the worksheet answer (I did this with the read a match sheet only). More Time Worksheets on their site. The kids really enjoyed doing these too. And they had to check their spelling of numbers especially for the crossword. After, for a short speaking activity I went to this website and had written in the numbers prior. Then the students took turns clicking the wheel on my PC and they had to make the time sentences. As a class we would all ask "What's the time _______?" (student name) and then they would click and answer. Its's ____ o'clock. Now, you could also add words, dinner, breakfast, lunch etc and make it harder but my students are low level so I will do that for next class. I will also write numbers like this : 9.10, 2.50, 4.30...etc. So we can start practising those times as well. Today was just an introduction. 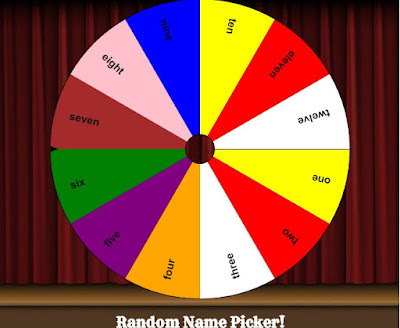 The wheel is actually a Random Name Picker - but I use it for many lessons as you can input anything you like! A good site to bookmark. Thanks for all your efforts and I'm sure quality teaching.